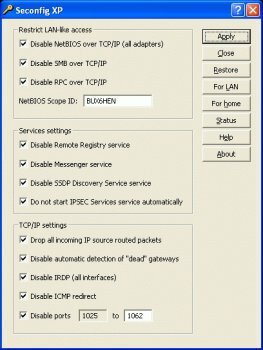 Seconfig XP can configure Windows not to use TCP/IP as transport protocol for NetBIOS, SMB and RPC, thus leaving TCP/UDP ports 135, 137-139 and 445 (the most exploited Windows networking weak point) closed. This tool works only with Windows registry (it doesn't install any files/drivers etc.) Seconfig XP can also configure other hidden security-related Windows TCP/IP settings and disable some insecure and mostly unneeded services. For additional safety Seconfig XP backs up every changed setting, allowing user to restore all settings to their original values. How do I know which ports to disable or not disable? Cant you put two more blank box to disable forinstance disable 1002 to 1500 ports and disable 500 to 1001 ports or enable this ports only!!! which ticks are safe for XP users because some XP users not live at the same country. Can we use this with firewalls or internet security software? Works fine with Vista. No problems, all gain. This tool fills a huge gap, especially for the home/home network use, where simple protection can be achieved in a simple way. BRILLIANT! I like the presets but prefer to separate the buttons from the apply/close set and be clearly titles PRESETS. Also would prefer the status, help and about butoons to be separated as well. The STATUS function is very good, but there also should be a button to keep/revert to current setting for preview (not just after applying) while the user is still experimenting with the interface. 5 stars + 1 for releasing it as freeware.